Baahubali : The Conclusion's Trailer(Telugu) becomes the most viewed Indian video on youtube in 24 hours! Creating records is not a new thing for Baahubali. The movie has created yet another record, this time on youtube. The telugu version of the movie's trailer released on 16th March has notched up an massive 21.8 million hits on youtube in just a day, making it the most viewed Indian Video on youtube in 24 hours! 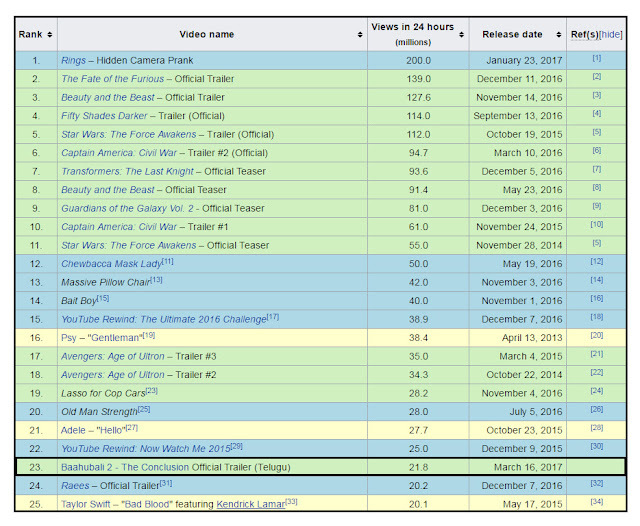 With this unique feat, Baahubali 2 Trailer has surpassed the 20.2 million view record held by 'Raees' and is currently at the 23rd position. 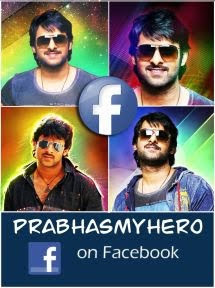 This record of 21.8 million views is only for the Telugu Trailer. 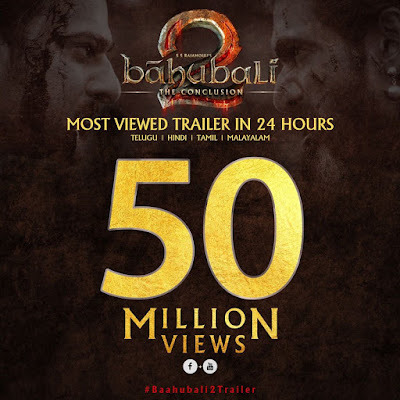 The Tamil and Hindi Trailers on Youtube have notched up another 4 million views while the Tamil and Telugu trailers on the Movie's Facebook Page together have about 5 Million Views. As per latest reports, the trailers have notched up a staggering 50 Million Views on Youtube and Facebook put together. Baahubali 2 is also widely expected to break many Indian Box Office records when the movie releases on April 28.